IMA World Health is excited to connect and collaborate with fellow global health experts during the Fifth Global Symposium on Health Systems Research Oct. 8-12 at ACC Liverpool in Liverpool, England. Strong health systems are key to achieving sustainable improvements in health and health care in any country. Since 2006, IMA has worked to build and support integrated, holistic and sustainable health systems that increase access to health care in developing countries, such as the Democratic Republic of Congo, Kenya and South Sudan. This work involves working directly with national and local government entities and other key players to provide technical assistance and capacity building support to strengthen engagement, capability and investment at all levels of the health system. Strengthening quality management systems: ownership and sustainability in Nairobi County, Kenya, a morning poster presentation Oct. 10 in ACC Hall 2M. Fostering community participation to improve service quality and health worker satisfaction and motivation in the Democratic Republic of Congo, an oral presentation by Janna Wisniewski of Tulane University School of Public Health and Tropical Medicine, USA, 2-3:30 p.m. Oct. 10 in ACC room 4B. 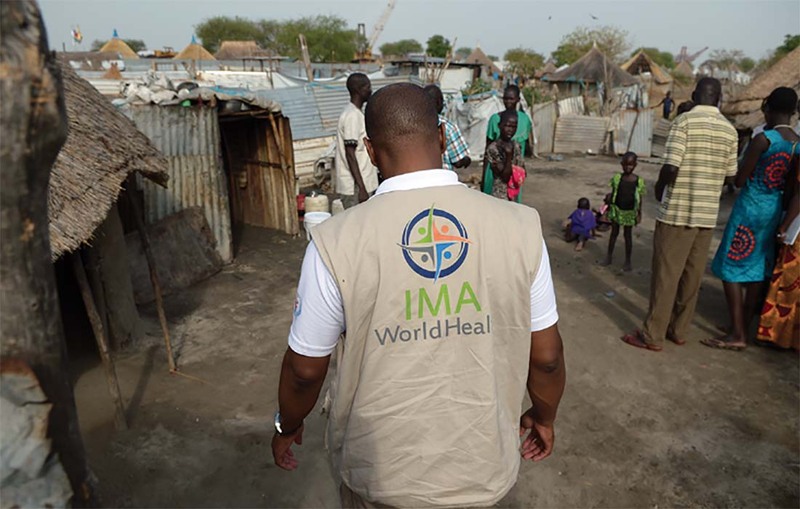 Bringing health services to communities through the boma (village) health initiative: lessons learned from 2017 in implementing South Sudan’s New Community Health Approach, an oral presentation by Sean Murphy of IMA World Health 11 a.m.-12:30 p.m. Oct. 10 in ACC room 4A. Mobilizing health systems to protect rural households in conflict-affected states: lessons learned from a mixed methods impact evaluation in the Democratic Republic of Congo, an afternoon poster presentation Oct. 11 by David Hotchkiss of Tulane on Level 3. IMA World Health will also take part in presentations that focus on the important role faith-based organizations play in strengthening health systems. Participants include Dr. Larry Sthreshley, IMA World Health/DRC; Dr. Bernard Ngoy, IMA World Health/DRC; Mano Mwa-Mur Ntayingi, IMA World Health/DRC; Dr. Mounir Lado, IMA World Health/South Sudan; Grace Makau, IMA World Health/Kenya; Matt Hackworth, IMA World Health; Sean R. Murphy, IMA World Health; and Brittany Parnell, IMA World Health. Symposium attendees are encouraged to stop by Booth 51 in Hall 2 to learn more about IMA’s efforts to strengthen health systems and achieve its vision of health, healing and well-being for all. The #HSR2018 theme, “Advancing health systems for all in the SDG era,” also aligns with IMA’s work in Tanzania and Indonesia, where IMA leads projects that promote healthy nutrition and feeding habits through behavior change communication. IMA’s research on childhood stunting-knowledge among mothers in rural Indonesia was recently published: Stunting-Related Knowledge: Exploring Sources of and Factors Associated with Accessing Stunting-Related Knowledge among Mothers in Rural Indonesia.1 The work was done in collaboration with Brigham Young University.